I’ve been a fan of Marian Keyes since I was about fourteen and picked up a copy of Watermelon. Her writing is funny, passionate and it draws you into her world with a warm hug. Eleven years on, I’ve read all the previous books and loved them in differing amounts. Her non fiction books (Under the Duvet and Further Under the Duvet) stuck out for me as particularly special, but I spent much time in the worlds of the Walsh family and their idiosyncracies. Much like the work of Emma Hannigan, with Keyes there is a habit of looking around your family and seeing them in the characters, it brings them to life. So, when I saw that there was a new book, The Break, to be read a little jump of joy was happening in me. So, what is The Break about? Going from this, I was excited to get stuck in. After downloading the book to my Kindle app, I read it on my phone. I admit to reading it as I was wandering around town, sitting in cafes, waiting for the bus. People gave me strange looks for laughing out loud. I’m not generally a laugh out loud kind of person, so this book must be some sort of special. The Break doesn’t shy away from the big topics. As well as the issues of relationships and how they change over the years, Keyes also makes reference to the 8th amendment. It’s handled in depth and in a wonderfully human way. There’s no dramatics, no shouting wildly about a message. However, it will hopefully open the eyes of her broader world audience to the situation as it is in Ireland currently, and will hopefully grab the attention of readers who may be on the fence. It’s not preachy or over the top, but it gets the message across. Neither Amy nor Hugh are perfect characters. Both go through phases where you’re shouting at them to dump the other, run off and join the circus. It’s true to life in that way. We’re all not 100% the people we really should be all of the time. The realistic portrayal of how it affects everyone else, how others react to the news and events going forward is refreshing. These characters are full-bodied and personable. It felt like I was sitting down with Amy for a cup of tea and a catch up at times, reading the chapters. The depiction of their relationship, the little issues that come up – it will speak to others who have been, and who are, in those shoes. The anticipation as to how it would all work out kept me turning the pages furiously. There’s a lot in there to unpack. Aside from the main characters; The Break is host to a cast of side characters who serve a purpose and are truly memorable. I love Alastair, he’s the work mate everyone should have. Her children, her “very modern” family, the interactions with her sisters – all of these things make up an environment which feels like you can just walk in and be a part of. Things like the reality of dealing with parents with worsening health and how the burden is spread among siblings – these are real issues, prevalent in so many families, and while not a focus, it’s a very real representation of what life in so many homes is like. It’s difficult to do as in depth a review as I would like without any spoilers. However, to do so would be unfair to the reader. Instead, I will just recommend to you to pick up this book, make some time. Stick on the kettle, tell the kids to fend for themselves and get stuck in – you won’t regret it. 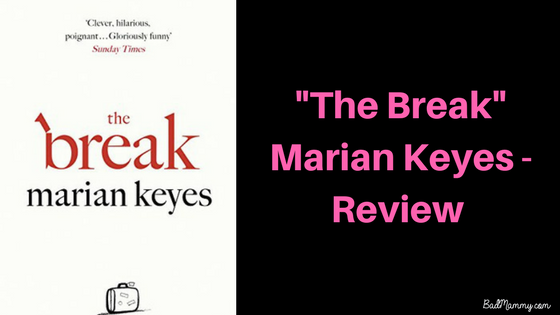 I was lucky enough to receive an advance review copy of The Break, but it’s out for general sale in early September, on Amazon and in all good bookshops. Ooo this sounds like a real page turner and a great light read which I think would suit me perfectly at the moment. And we’ll done on no spoilers!! Thanks for joining in #paperparadise too! It really was, I hope you enjoy it!